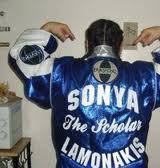 ***FLASH UPDATE: SONYA “THE SCHOLAR” LAMONAKIS TAKES IT! ***FLASH UPDATE: SONYA TAKES IT! Sonya “The Scholar” Lamonakis fought her heart out to the cheers of her legion of fans taking the six round bout against Tanzee Daniels, 59-55, 59-55 and 58-56. 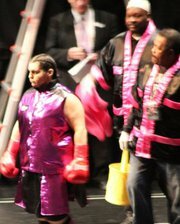 With Sonya’s win she has lived up to her billing as #1 ranked WIBA women’s heavyweight contender and improved her record to 4-0 with 1-knockout. Fightnews.com has the story here. Boxingscene.com has some great color about the fight here (scroll down to 8:27 and read-on from there). FYI, Boxingscene was live tweeting the fight! © Malissa Smith and Girlboxing, 2010-2015. Unauthorized use and/or duplication of this material without express and written permission from this blog’s author and/or owner is strictly prohibited. Excerpts and links may be used, provided that full and clear credit is given to Malissa Smith and Girlboxing with appropriate and specific direction to the original content.